Every time I get close to the end of Church Street I start to crave tuna heart. A specialty food from Sardinia that is the heart of tuna cured into a purple red colored meaty piece with a strong umami flavor. 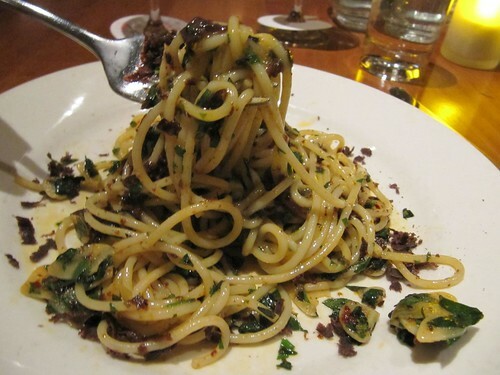 Two restaurants in that neighborhood serve it shaved onto pasta. It was a perfect night to hit Incanto, the restaurant was busy enough to have some atmosphere but not so busy as to overwhelm the kitchen. I had a good view of the kitchen where the two chefs worked quickly, efficiently and at controlled pace. 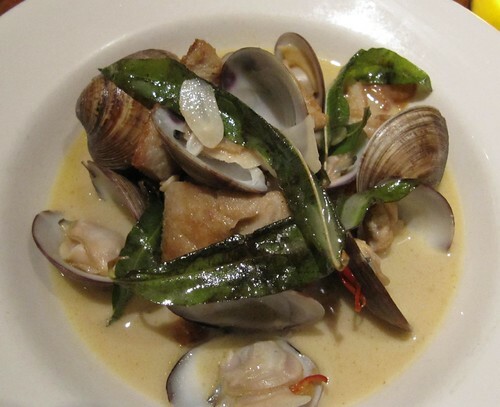 I started with a dish of clams and tripe in a buttery broth tasting of the sea with a little base note of heat from a bit of chili, topped with some leaves of lemon verbena. The tripe had a perfect texture -- tender with just enough meaty bite. The spaghetti was just as I remembered it, a balance of briny smoky tuna heart with the smell of garlic and the silky richness of egg yolk. Incanto might have a sort of 90's staid old world traditional Italian decor, but it's friendly service keeps it from being stuffy.